It’s so much easier than you think to make your own kombucha – I was blown away! I’ve been wanting to make my own kombucha for a very long time! I actually began a batch late last year – I grew my own SCOBY (that’s a symbiotic culture of bacteria & yeast, for the newbs) from scratch and had transferred it to sweetened tea and was just days away from taking my first sip – but then life intervened and the whole batch got flushed down the drain. Sadness! I tried using the same brew method when I was in my new place, but found that I couldn’t get a SCOBY to even begin growing. What gives? Well, since the whole “there’s alcohol in kombucha” ordeal happened, distributors changed the formula and now it’s nearly impossible to grow a SCOBY from just a bottle of kombucha and sweetened tea, like you used to be able to. I’d heard from Food Renegade and other places that you could order a healthy SCOBY from a place called Kombucha Kamp, where the owner, Hannah Crum, had perfected the SCOBY growing method. I just wasn’t sure if I wanted to make the almost $30 investment in a SCOBY during a financially lean time. I’ve mentioned here that I suffered from a host of stomach problems last year, and it was really when they began to return recently that I took a hard look at my diet and what had cured my stomach problems last time. In the early part of this year, I’d lost a lot of weight and went a little overboard with trying to put it back on. After a few weeks of eating candy and bread when I wanted to, my stomach loudly complained and I cut them out. But I still had tummy troubles, and I decided that the healthy probiotics in kombucha had probably healed me more than anything else. With that in mind, investing the $25 in a SCOBY from Kombucha Kamp was a no brainer. It arrived in just a matter of days and let me tell you, this thing was bigger and much scarier than any SCOBY I’d been able to grow on my own! At well over an inch thick, this thing (which I later named “Big Mama”) scared the crap out of me! The instructions included with the SCOBY were remarkably simple – much simpler than the ones I’d been following online last year. I’m pleased to report that Big Mama took well to my batch of brewed sweetened tea and a new baby SCOBY was growing healthily on top of the mixture in a matter of days! Baby Boocha SCOBY, growing happily on top. Big Mama is lurking in the depths below, turning sweet tea into a magic healing potion. It took just eight days to brew the most fizzy, delicious kombucha I’ve ever had. It tastes almost like apple juice and I am in love. Big Mama and Baby Boocha are back in a new batch of tea as we speak. So, are you ready to take the plunge? Brewing this stuff is easier than you think! 1. Boil 4 cups of purified water. (Purified means filtered & without chlorine. If your filter doesn’t dechlorinate, simply place 4-ish cups of filtered water out and let it sit overnight. This is important – chlorine will harm your brew). 2. Just as the water begins to boil, turn off the heat. Let cool for 1-2 minutes. Add the boiled water to your brewing vessel. 3. Add 4-5 bags of the organic tea of your choice to the brewing vessel. Let steep 5-10 minutes. 4. Remove tea bags. Add one cup of sugar (I use unbleached organic cane sugar – yes, it must be cane sugar, and don’t worry because your SCOBY “eats” it so you don’t have to) and mix until dissolved. 5. Add 8 cups of purified (sans chlorine) water to the mixture. This should cool everything down so that the tea is around room temperature. Test with your (clean) finger – if the water is cooler than your finger, you’re good to go. If it’s still too warm, let it sit, covered with a cloth, for 30 minutes and test again. 6. GENTLY add kombucha SCOBY and starting liquid. 7. Cover the mouth of the jar with a cotton towel and secure with a rubber band. 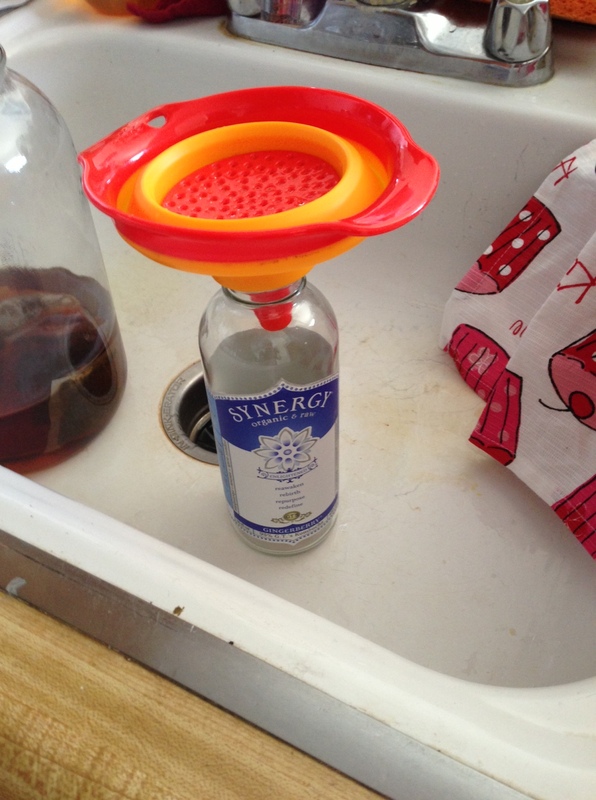 Place the mixture somewhere dark that has ventilation – mine sits right under my sink with the cabinet door open, but on top of the fridge or on a counter will work as well. 8. Check your kombucha everyday. 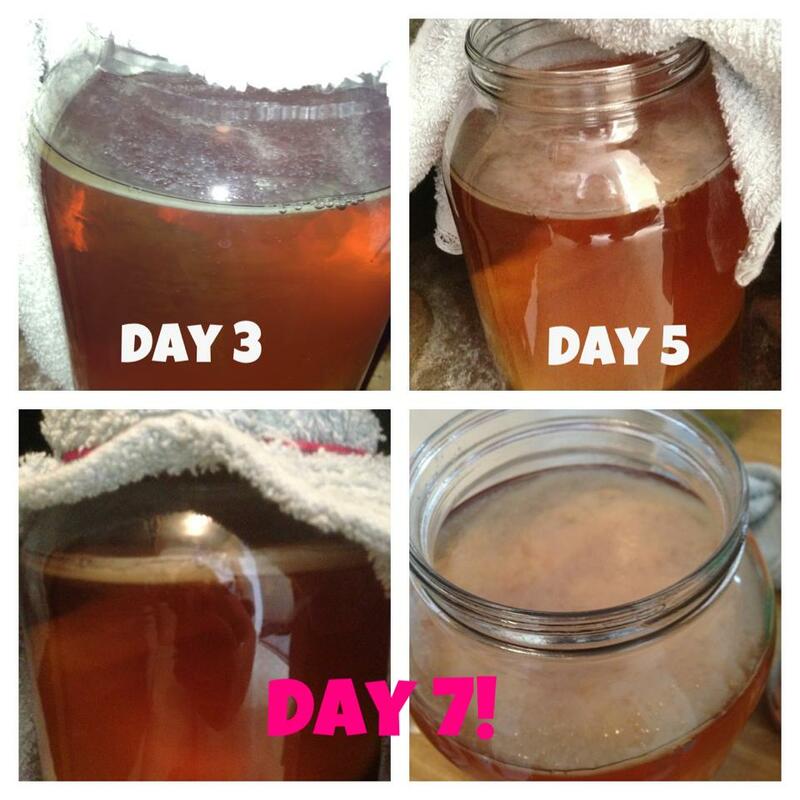 After a few days, you will notice a new baby SCOBY growing on top – this is good! Each batch you make will grow a baby SCOBY and once they’re mature, you can give them to friends to share the kombucha love! Here’s how my kombucha progressed as the days went on. You can see the little baby SCOBY growing! By day 8, the kombucha tasted exactly how I wanted it and I bottled it up! 9. The Hippie Truth – When I grew my SCOBY last year, my man and I sang to it, told it we loved it, and did other slightly kooky hippie-ish things, like leaving a little post-it note with a heart drawn on it on the jar. It had been growing slowly, and I suggested as kind of a joke that we tell it we love it everyday. (Don’t laugh at me – I’d heard about this and was serious!) 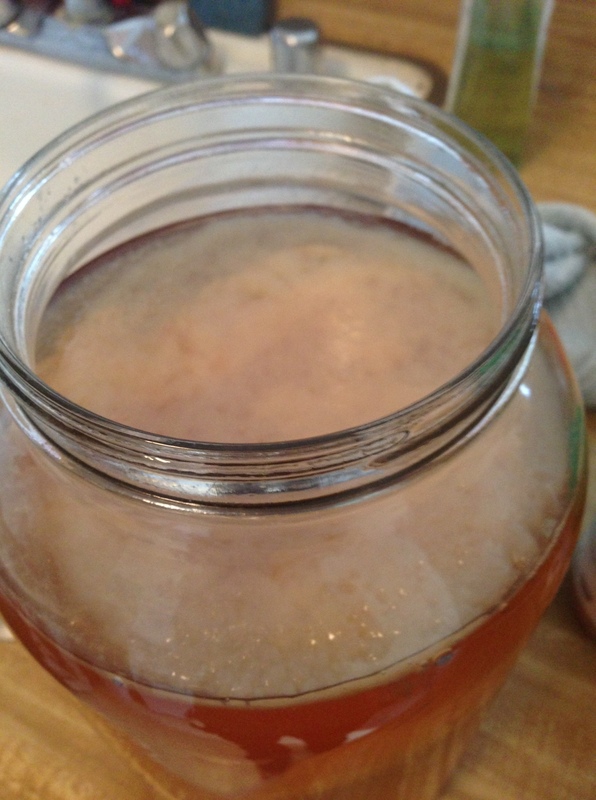 And, placebo effect or not – the SCOBY started growing like crazy after that! I was really surprised when I got my how-to from Kombucha Kamp and Hannah had suggested the same thing! She suggests blessing the kombucha, singing to the SCOBY, playing it music, etc! “Good vibes, crystals, happy music, and talking or singing to your Kombucha will encourage positive growth. Your SCOBY is a living organism – treat it with care and it will be your booch buddy for life!” Hey – whatever works, right? I happen to get very attached to my SCOBYs (read below – I got unbelievably worried when I feared that I had to save mine from a certain bacteria) and I feel connected with them! So anyway, I say hello to my SCOBY everyday and, um, every once in a while, you might catch me putting my iPhone under the sink and playing it happy music. Whatever. 10. 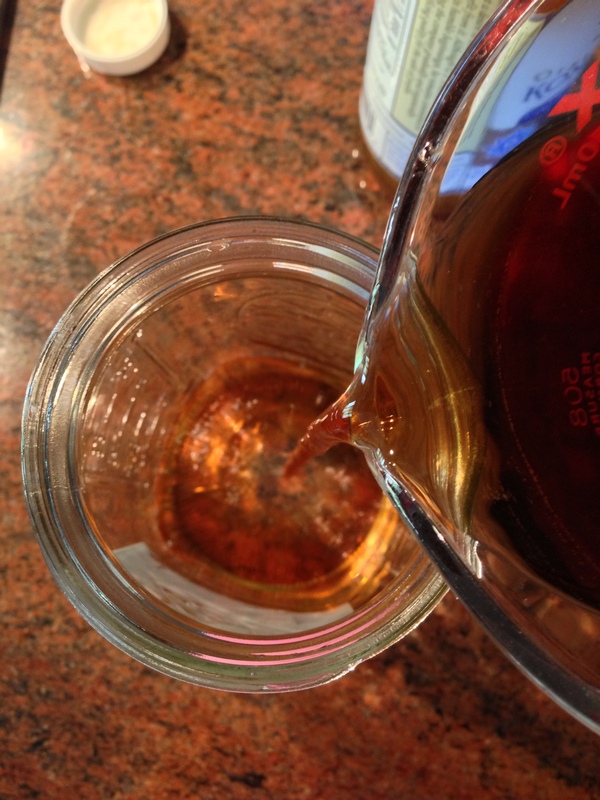 After about a week, gently stick a clean straw under the baby SCOBY and take a sip. 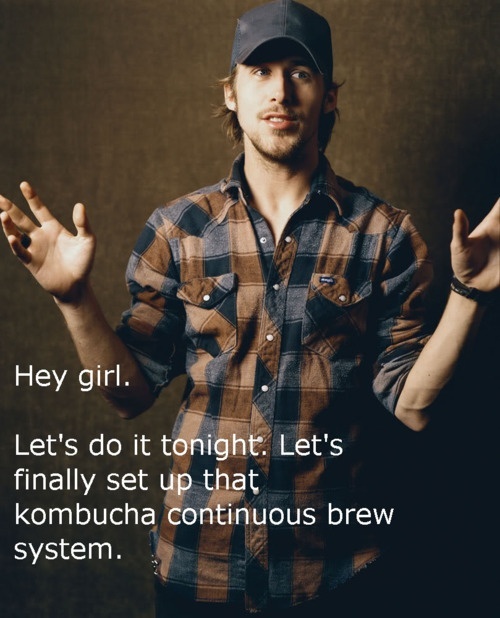 If it has the sweet/sour punch of kombucha, you’re done! If it’s still too sweet, check every other day until it tastes right! 1. With clean hands, remove baby and mama SCOBY and set them in a clean bowl. Pour 2 cups of your mature kombucha over the top – this is your starting liquid for your next batch. Cover with a clean cloth towel and set aside. 3. 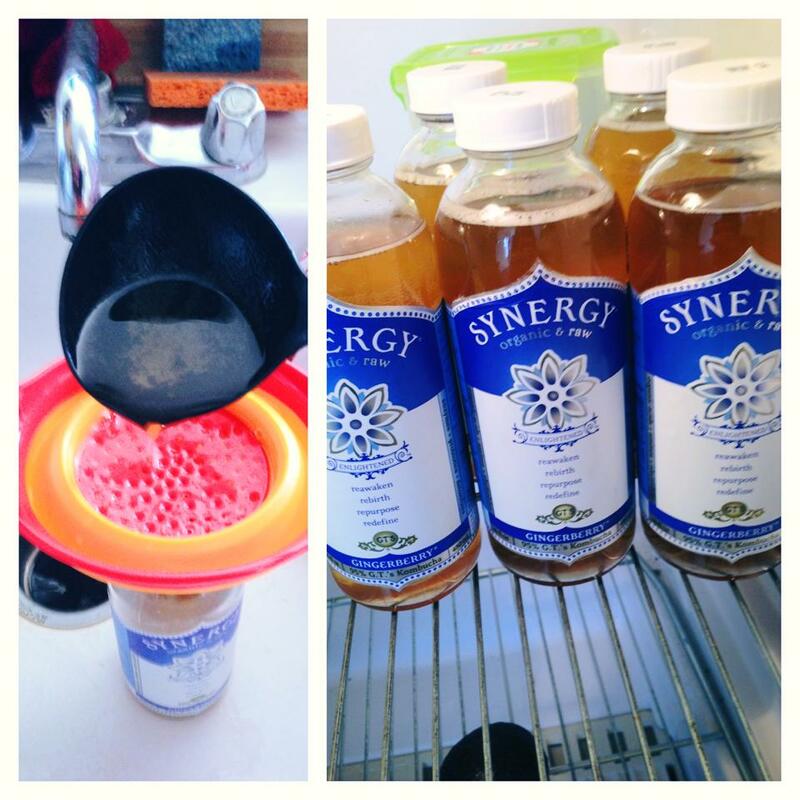 Ladle your kombucha into each bottle. 4. If you’re going to do a second fermentation, now is the time to do so. You can add a little fresh fruit, dried fruit or fruit juice at this point. The fructose adds to the yummy fizz most kombucha has, so if that’s the part you love, you’ll probably want to do a second ferment. I’m not too experienced with this yet, so you can find some great resources for a second ferment here, here and here. I personally want to make a cherry lime flavor and a pineapple/coconut water flavor! 5. If you’re not doing a second ferment, you have a few choices – you can seal up your bottles nice and tight and place them in a box or other container (reason? sometimes bottles EXPLODE as they keep fermenting – yikes). You can then “burp” the bottles once every day. This process will increase the carbonation of your brew. Keep tasting them to avoid them getting too vinegar-y for your liking. Or, you can stick them right in the fridge to slow the fermenting process and enjoy at your leisure! Kombucha Kamp – The Benefits of Drinking Kombucha. This list is amazing! Kombucha Kamp – Brewing Safety Tips. A TOTAL must-read. I did several things wrong when I was brewing last year. Food Renegade – Double Fermentation Process. An equally good resource! Holistic Squid – How to Make Kombucha (A Visual Guide). Another super good resource. 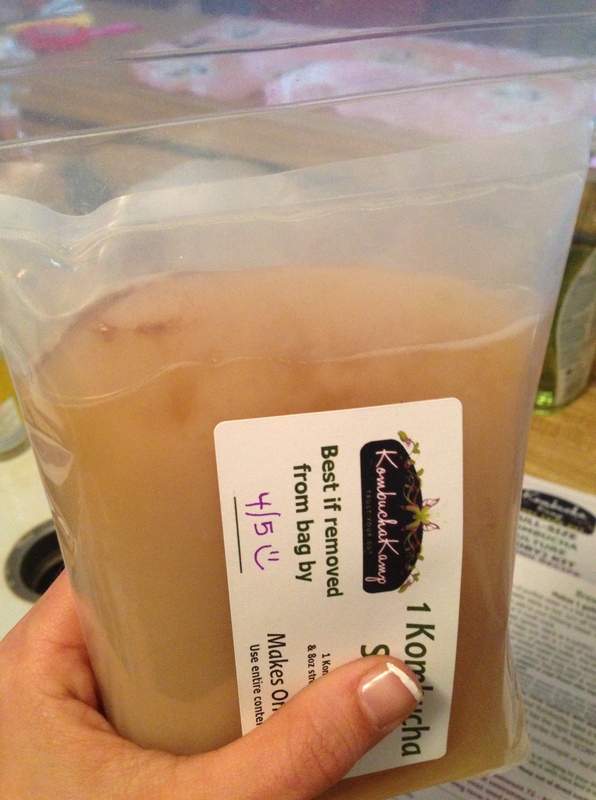 Holistic Squid – Has My SCOBY Gone Bad (and other Kombucha Questions Answered) – ‘Nuff said. Village Green Marketplace – Water Filter Options. I HIGHLY RECOMMEND you either buy distilled water or purchase a nice water filter. My BRITA, along with letting the water sit overnight, wasn’t enough to stop a sulfur, rotten-egg-like smell from coming from my first batch. Some resources say you can have sulfur in your tap water – others say this is a kind of bacteria that grows that gives off the sulfur smell! I didn’t know which was the case, but I had to assume it was bacteria just to be safe. I had to go into overtime to save my SCOBY, including soaking it in distilled vinegar overnight. 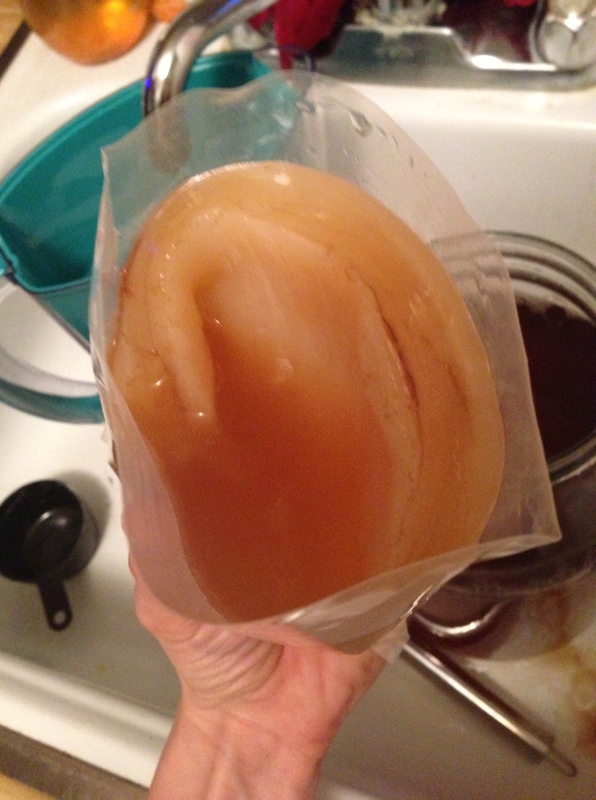 Don’t spend $25 on a SCOBY just to get attached to it and have your heart break! Do it right with a pure water source the first time. Has kombucha helped your health? How so? Hey- this is Great!! So excited to try…thanks for all of the info. Miss your smiling face, hope to see you soon! Thanks for the fun and easy-to-follow instructions for home brewing kombucha! I started drinking it a few weeks ago and think it’s delicious. But the cost per bottle was really putting a crimp in the wallet. I’m super excited to try this out!